Existing customer thinking of switching over to a fibre landline plan. ONT is in the garage, RGW in lounge, main phone point at other end of lounge, and another phone point in a bedroom but the line to it is cut. I assume the ETP is under the house near the main phone socket in corner of lounge it comes in underground from the street. What might the tech do in this situation? Would it involve the $49 charge or a free DECT phone? jonb: Existing customer thinking of switching over to a fibre landline plan. ETP is usually outside, a plastic grey upright thing. The Chorus guys probably better to answer, but they will connect the ETP to the white box they will locate near the ONT to liven all jacks. That's the $49 charge. One Jack is cut? More likely not connected which I think they can reconnect at the ETP. As I mentioned earlier, when tech installs jacks, maybe an extra Jack, or the Sky guys do their thing, some are easy, some are a PITB, swings and roundabouts. Not really any different to a sparky if you got one to add a power point, maybe easy, maybe a pain, but it will get done. I was in the same boat (ONT in garage, RGW in study) and recently changed to fibre landline. What I found was that when Chorus/Downers originally installed the fibre to the ONT, they also ran a copper pair (and left one end coiled behind the ONT). The tech that came to install fibre landline *expected* that the copper pair had been run between the ONT and the original copper ETP. It hadn't (he checked the ETP). I suspect that (because of my copper ETP location (on a brick wall with little access)) the copper pair had been run back to the street junction outside my house. I believe that the original intention would have been to connect that new copper pair to the POT port of the ONT, then join the remote (street) end to the incoming copper to my house. InstallerUFB: If you have a newer Chorus ONT install (within the last 18mths) then the install techs would/should have already installed a socket next to the ONT (that will be used to take your voice services back to the external test point and on back into your existing phone wireing) - if yur install is older that that then there may not be a socket installed on the end of the cable but it normaly can be without additional cables bing run. Which Downer form are you refering to? - Do you mean the form that Downer uses that sets out what "Spark" offer? The online Downer form Spark customers are directed to when they upgrade to a Fibre Landline plan. According to it you've either already got the phone wiring box, or you need it. No option to plug straight into the ONT. old3eyes: If I move from say one part of Auckland to another can I take the number with me?? You couldn't do this with an analog phone of the old NEAX system.. I was on VDSL 30/10 (home line package) and I asked Spark to upgrade my plan to Fibre 100/20 (home line package). June 4: The fibre connection was completed, and I started using it on the same day. Unfortunately, the fibre speed stays at approx. 30/10, the same as my VDSL connection. June 8: I emailed Andrew at Spark (who was the one who took my call and helped me upgrade my plan before the actual fibre connection) to inform him of the problem. Currently it is still showing as 30/10mbps. It is still with the techs, whether for them to it sign off to say it is completed, or whether they are still looking into it on our end for whatever reason. However I can email our provisioning team and get them to change it 100/20 asap, however please be aware this can take up to 5 days as we require a tech to change it at the exchange end. We will send a txt to advise when this has been completed though. Not sure why it is taking so long sorry, I have resent the details through to Chorus for them to get onto it asap. Andrew has been helpful so I don't have any issue with Spark. It appears Chorus is the issue. Does anyone has had a similar problem upgrading to a faster speed? Also, I notice the WAN indicator on the Spark HG630b Home Gateway is still blinking even though the manual says that it should remain steady. Any hint of the problem? 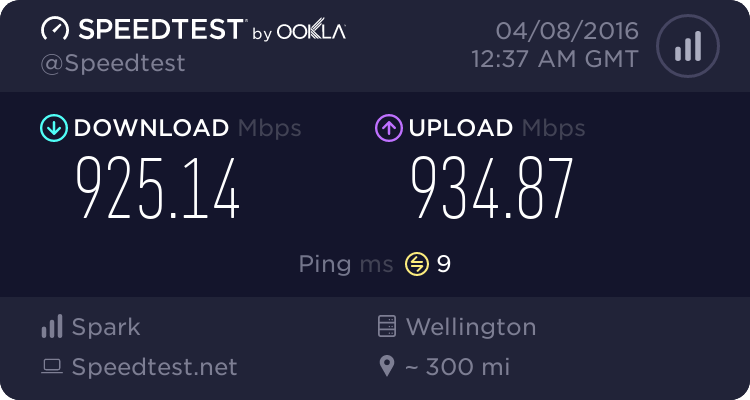 Today the speed finally rose from 30/10 to Fibre 100/20. Great. Still one question: The WAN indicator on the Spark HG630b Home Gateway is still blinking even though the manual says that it should remain steady. Do I need to worry about it? Kassey: Today the speed finally rose from 30/10 to Fibre 100/20. Great. There was a weird bug in one version of the Huawei code that the WAN light stopped flashing. That must have been fixed. Is the caller display on fibre landline number only or does it show name and number? Caller ID presents the number, but if you have this number stored in the address book of your phone, it will display the saved name. Showing the name is fully dependant on your phone, but just about every recent cordless phone will do this.